Airsoft Batteries | Airsoft Gun Battery Guide and Tips for AEGs, Rifles. When you are purchasing or upgrading your AEG's, battery size is critical. Mini batteries and smaller sticks should never be used in upgraded airsoft guns. The mechbox has a difficult time turning over and they will not last very long. Overpowered airsoft guns will push a mechbox so fast, that they can easily damage gear and piston stripping. We (my brother and I) have always bought and recommended AEG's with a large battery storage. Custom batteries are also highly recommended for certain AEG's. Custom batteries that usually require no modification are the ones we are particularly fond of. When you run a 9.6 volt 1700mAh NiCad battery in a HK51, they are made with "4/5" sized cells. The "4/5" sized cells are slightly shorter than normal sized cells but still quite big in diameter. A 9.6v 8 cell battery is shorter than a normal cell 8.4v 7 cell, but the extra cell is worth sacrificing over a higher mAh. This particular battery makes you not have to modify your stock. It is a great size for replicas with battery compartments that are tight fitting like the Airsoft AK-47 and Fa-Mas. If you have access to a replica with a small battery storage, you have a few options. One choice is the "battery bag". A pouch for example, an extra magazine pouch, that disguises the battery. You would just run extra wire from the forgrip. Another option is to leave the top half of the forgrip off and use rubber bands, electrical tape or athletic tape. If you want to use duct tape, we would suggest you don't, it can and will leave unwanted residue. A friend of ours purchased a specialty 9.6v M4 battery for his XM177 airsoft gun. The battery doesn't work for the XM177, as the forgrip is skinnier. He left the top half of the grip completely off, then he wanted the full forgrip back on. He decided to run the wire through a drilled hole, from the back of the battery's forgrip inside the carrying handle. It looked much better than the last time but it still doesn't look great. Having a great charger is very important. A great charger that keeps your battery in great condition and gives your battery a maximum charge. Peak chargers are easy to use, they will properly charge your battery and you don't have to guess the battery's temperature. Great places to search for chargers are R/C hobby stores such as: www.hobbytron-airsoft.com . AC is used to charge your battery at home. DC is used to charge your battery off or your car when you are in the battlefield. Great for NiCad users. It's best to get an automatic cut off discharger so it won't over discharge your battery. Dischargers can be purchased separately from chargers. Get the voltage and mAh ratings that are high enough for your particular battery. 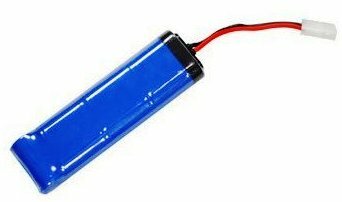 Many R/C vehicles run 7.2.v batteries. The chargers sometimes won't be made for 8.4v or 9.6v batteries. Now we are heading to the good stuff! Here is your essential airsoft battery guide. This battery guide will provide the advantages and disadvantages of a particular battery. Ni-CAD batteries were only being produced for airsoft electric guns. Ni-CAD are pretty good batteries. They have to be well maintained. Ni-CAD have to be discharged completely before you charge them, the cells contained inside have a memory effect. 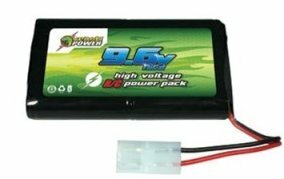 We Airsoft players have been searching for more powerful and higher capacity batteries so we don't have to worry about discharging the battery before recharging it. This started the production of NIMH batteries. NIMH batteries, in the beginning, didn't perform very well. Some NIMH batteries had claims that they had 3000 mAh capacities but they had very low output, which was evident when the firing of the airsoft gun was firing at a slow rate. Nowadays, NIMH batteries have started to produce higher capacity batteries and higher output. The rate of fire was increased as well as the pushing power for airsoft guns with stronger springs. These NIMH batteries weren't perfect yet, they had one flaw. NIMH batteries are sensitive to heat which affects the performance of the AEG. It can damage the cell, which decreases the performance. With proper operation of the batteries, this problem is solved! The normal size of a large cell is Sub C but different brands do not have the same size. More capacity equals longer length and bigger diameter. The normal size of a small cell is 2/3A. Modifications are not required to the battery compartment (s). The small type is the same as the stick type because the cell sizes are the same. 2. It is a good idea to discharge a NIMH battery (even if they don't have to be discharged before recharging) to cycle the NIMH battery pack. For small battery packs: Choose 1 amp (especially on NIMH batteries, they can overheat and damage cells). For large battery packs: Choose 2 amps. 4. Invest in a charge that has an automatic cut-off and a peak detection; to avoid overcharging the battery. 5. If you have an upgraded airsoft gun, replace the fuse with a higher amp. Never take out the fuse from the upgraded gun for a higher current flow. 6. Invest in a MOSFET. MOSFET are expensive but they help protect electrical components and boost the performance of the airsoft gun. Everything you need to know about airsoft batteries is here in this guide. We hope you enjoyed this battery guide. Picking which battery to use for an airsoft gun is one of the most important aspcts of airsoft.